Train to the right BPM. Studies say that working out to music can increase your endurance by up to 15% Here and here are two super cool of workout playlist apps. For the blisters that are bound to happen, second skin sticks to your feet in your shoes, even if your feet get sweaty damp. They say that during activity you should be drinking water every 15 minutes. So fine, when I’m outside for a practice jog (or walk or whatever) that means I’m usually carrying keys, some form of ID, some form of money (In case I collapse and have to call a cab? I don’t know why really, although I’m sure that’s not impossible.) and a cell phone. 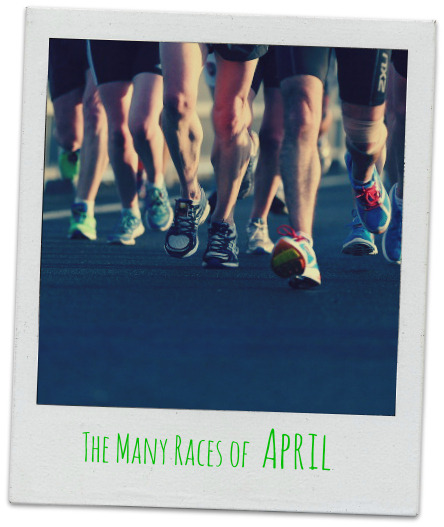 Races in April - Choose the one for you! One of the biggest 5K events every year, full to brimming with everything pink, the Race For The Cure can be a celebration and a memorial and hopefully a fundraising event that contributes to bringing down breast cancer forever. Walks, runs and timed runs available for the whole family. Held on Butler University’s lovely campus, this 3rd annual race to benefit Payton Manning’s Children’s Hospital will be a treat for every age. The event features a live DJ, games, food, drink, raffles, mascots, face painting and beyond. Another fun point is that kids race free! There are awards given for each age group. Find out more on the registration page. What more natural combination than Easter bunnies and 80’s Rock? There is bound to be lots of fun at this all age event. This race has both, plus an egg hunt, petting zoo and chance for pictures with the Easter bunny. Race with Disability Legal Services of Indiana at the 3rd Annual 10K Run/5K, open to all ability levels. This event is open to the whole family and supports educational advocacy for children with disabilities . A chance to race as a team of up to six participants, this relay is a fun event for runners and walkers with multiple distance options depending on your team size and personal goal. In this event, participants walk for inclusion, friendship, leadership, and opportunity for people with and without Intellectual and Developmental Disabilities (IDD). This family friendly walk to support orphans in Russia and India includes options for walk, run and chip timing.